We stayed at the Days Inn, Niagara Falls. After we checked in and unpacked, we drove about a mile to the state park. We paid our admission and parked the car, and then walked to the observation tower. You can see the beautiful view of the US falls in this picture. It was hot on the observation deck. Lucy put a quarter in the binoculars and got an even closer view. Next, we took the elevator down to the Maid of the Mist . 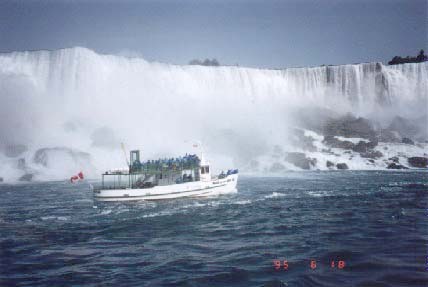 This boat ride takes you along the bottom of the falls. The US side has a jumble of huge boulders you can see behind the boat in this picture. Niagara Falls recedes about one inch a year on average. 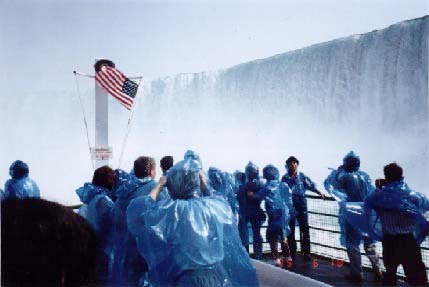 The Maid of the Mist operators give each customer one of these blue raincoats. Here, it was dry enough for me to take a photograph. Most of the trip, Thomas (age 2) was trying to take off Lynne's hood. Stopping him kept Lynne busy enough that I took all the photographs. This is a view of the Canadian falls. The "mist" was so dense that it felt like a heavy downpour. The Maid of the Mist operator told us that in the past, they have picked up daredevils who go over the falls. We didn't know it then, but two people went over the falls that day and were promptly arrested. The New York Niagara Falls park is big, and it takes a lot of walking to get around it. We got pretty hungry by dinner time, but still decided to drive to Canada to eat. We took the Rainbow Bridge, and it was no hassle getting there. We asked the immigration attendant for directions, and he said "Go straight off the bridge .." to the tourist district. Well, straight off took us in a round-about way to downtown, which was dead. Ten minutes later, retracing our steps, and we found "go straight" means "veer left". This was only the first time on the trip that we found local folks often give directions that are mostly helpful if you already know how to get somewhere! 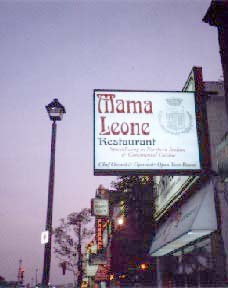 After paying $4 US for parking, we wandered up the main street, and found Mama Leone , a very nice, quiet Italian restaurant. Thomas was pretty active, so Mama Leone wasn't quiet as long as we were there. We changed a $10 US bill for $13.43 Canadian at an ATM, and Lucy got to buy some souvenir placemats for herself and Thomas. 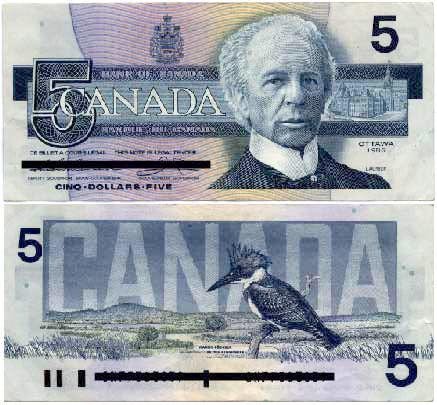 What was left included this $5 bill and a "Loonie". Canadians figured out the dollar coin business better than we did in the USA, because "Loonies" are in common use. Next, we drove to the Canadian falls park to see the after-dark Niagara Falls light show. Parking was $6 US, all day or 30 minutes. The show started at 9:15 and was worth it. The Canadian falls look about three times larger than the US falls. 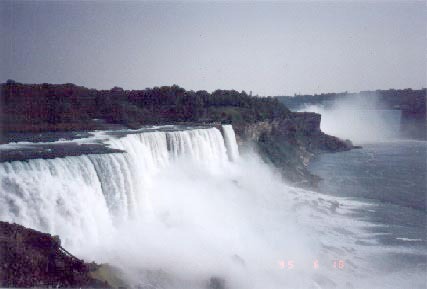 The viewing area in Canada is directly across from the falls, instead of next to the falls as it is in the US. The view is even more dramatic. A bank of powerful lights shined changing colors into the falls and mist. The mist rose up as far as the brink of the falls. The show was truly breathtaking, and was a good way to finish an exciting day. You can also visit the Niagara FallsCam Home Page and Info Niagara - Niagara Falls. Last updated 2001 May 17.